Tirsdag 23. april 2019 oppdateres ap.unit4.com med nytt HTTPS sertifikat. Samtidig økes sikkerhetsnivå til TLS 1.2 og støtte for TLS 1.0 / 1.1 fjernes. Sørg for at alle kode som integrerer seg direkte mot ap.unit4.com støtter TLS v1.2. Nytt HTTPS sertifikat kan verifiser mot vårt testmiljø allerede i dag. 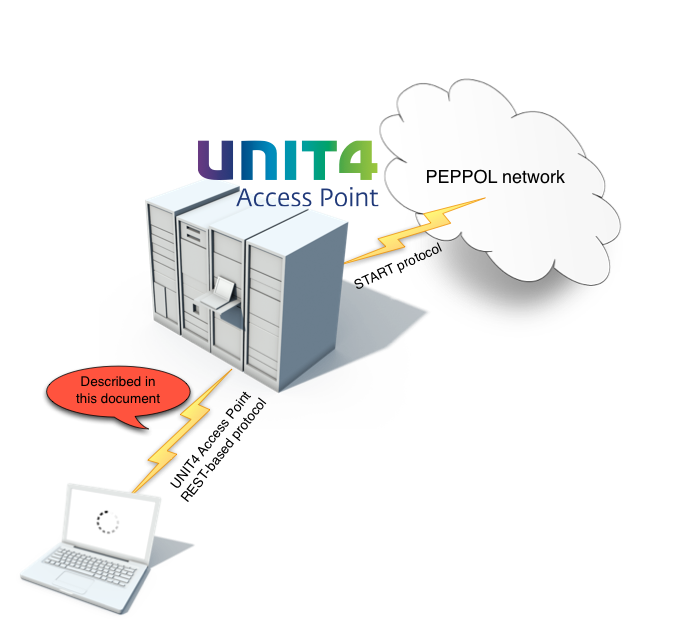 To send and receive business documents like orders and invoices thru the PEPPOL network, Unit4 provides a HTTP based client API as described in this document. There are two separate access points available, one for testing and one for production. NOTE! These URLs might change in the future so keep them configurable in your integration code. If you want a test account, send an e-mail to support with your company name, organisation number, postal address and a technical contact person (including e-mail and phone). Or you can self regiser a test account online and can verify your integration by sending a single test invoice to DIFI's test recipient. You should shortly after (within 15 minutes) be able to see that it has been delivered to DIFI. To obtain a production account contact sales by email to get correct pricing and system-code. Then simply fill out the registration form by clicking register link at the front page. You will instantly be able to exchange messages with all other PEPPOL receivers in production. You may send invoices on behalf of any company by specifying its PEPPOL ParticipantID as sender. You can receive invoices to a company associated with your own account. A company can only be associated with one account for incoming messages. In addition to handling the invoices of several companies from a single account it is possible to create multiple accounts paid for by the same company. This allows customers of the access point to create separate accounts for their own customers. To create additional accounts you must contact us by email. Senders and receivers needs to be identified using their PEPPOL ParticipantID's. All receivers must be registered in an PEPPOL SMP (catalogue service) with a list of document types they support and which accesspoint they should be delivered to. The senders do not need any registration, but you must to use a proper ParticipantID of the form CODE:IDENTIFIER, like 9908:810017902. PEPPOL ParticipantID is built up with a scheme code (a 4 digit ISO6523 code) followed by a ':' and the actual identififier. In Norway 9-digits organization numbers are used as identififiers and the scheme code for NO:VAT is 9908. A full ParticipantID could then be 9908:976098897. In order to transfer messages you must specify a legal DocumentID and ProcessID (aka ProfileID) combination. The following table are examples of real values. You should always fetch real values by performing SMP lookup (described here). We have chosen a REST type HTTP transport between the access point and the clients. Transport is secured by HTTPS so make sure your client support TLSv1.2+ and modern chipers. We use Basic Authentication according to RFC2617. Since communication will be performed using HTTPS, authentication credentials are secured. Make sure you enable Preemptive Basic Authentication in your HTTP client library. We use XML as data-format for request and response, so make sure your HTTP client adds Accept: application/xml headers. All messages will be assigned an unique msg_no (long integer). This will be the key to do operations on the message later. When you list each of the message stores below you'll get meta-data about the messages. This meta-data includes an URL where you can download the actual message content. OUTBOX When you send messages they will be visible here until they are delivered. INBOX When you receive messages they will be visible here until you have fetched them and marked them as read. MESSAGES All messages will be available here and simple search and pagination is available. If the message is received from another access point it is deemed to be inbound and direction is set to "IN". Messages transferred by us (Unit4 Access Point) to another access point are deemed to have a direction of outbound, hence direction is set to "OUT". The timestamps "received" and "delivered" have slightly different meaning when sending and receiving. The table below shows the methods available thru the public api..
/outbox POST Places documents into the outbound queue for transmission through the PEPPOL network. GET Retrieves the status for a message previously placed into the outbound queue. /inbox GET List of all received messages, which have not been marked as read. POST Marks a message as read, thus removing it from the /inbox view. /directory GET Retrieves information about recipients capable of receiving electronic documents. Basically you may view the resources /outbox, /inbox and /messages as "views" into the message repository of the access point. I.e. once a message has been sent, it is moved from the "outbox" into the archive of "messages". A link referencing a message in the /outbox will still be valid once the message has been "moved" to /messages, however; the contents returned will have changed. A message which has been sent will have it's delivered timestamp and transport uuid set. NOTE! The URL's included in the responses might change and are for illustrative purposes only. Do not hardcode them into your application. You should follow the hyperlinks returned. Check what processes and document types the receiver accepts. Generate an PEPPOL document that conforms to the CustomizationID and ProfileID the receiver accepts. Send file using the "outbox" resource with correct sender, receiver, process, document and channel identification. You must use "multipart/form-data", which means that all parameters should be sendt as form-data and not as http-headers. The following is an example illustrating how you may send the file named "invoice42.xml" using cURL. Uploads the supplied file using the given attributes. The message is placed into the outbound queue for transmission. Retrieves a list of messages which have not yet been transferred into the PEPPOL network. If message with given number doesn't exist, 204 code will be returned. This will set the "delivered" timestamp on the message to the current time stamp on the server. Consequently, this messages will no longer appear in the list of messages returned by "GET /inbox". Response: a list of messages. When accessing the /inbox, /outbox or /messages resource, only a maximum of 25 records will be retrieved. If there are more than 25 messages a navigation element will provide links to the previous and next page. E.g. Accessing third page (https://ap-test.unit4.com/messages?index=3) will result in below output. NOTE! There can be several possible document types for the supplied "local name" and there might be rules when it comes to which you should use. For cross-border you might have to use the international BIS variant and within a country you might have to select a more specific local variant like EHF (ie, this is mandatory between Norwegian participants). If there are no accepted document types, 204 code will be returned.